Two posts ago I mentioned that I’d found a healthy, tasty and inexpensive, dairy and nut free cereal bar in a certain supermarket. They were called ‘Goodness Bars’. Ladies and Gentleman, it is with regret that I tell you that my local store (T—-) have stopped selling the goodness bars. Yes. I know. Erhem. Okay I’m a little upset. Well think about it this way, imagine most supermarkets didn’t sell chocolate and you had to search endlessly to find any. When you did find some, in a specialist store, you were unimpressed to find that they sold each small bar for £6.50. And then you finally found an inexpensive, tasty supply of chocolate at a local store. So what do you do? You rejoice. You buy more chocolate than you should. You bask in the fulfilment they give you, and you eventually begin to expect a weekly dose. And then, without warning, it was brutally take away from you, less than two months later. Yes. Exactly. This is what it feels like. In disbelief, I went to check online, just to really make sure they don’t stock them. Funnily enough, they are still selling them online (apparently). This, is not the point. Sometimes you don’t want to buy online. Sometimes you want to eat as soon as you leave the store. 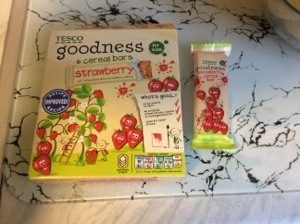 But these are crisps, not cereal/fruit bars. Surely I’m not the only one that requires dairy and nut free cereal bar goodness?! This isn’t the first time a supermarket has thoroughly disappointed me by discontinuing products that I like. I’m feeling let down by grocery stores everywhere. I’ll be optimistic and hope that eventually they will start to produce dairy free, nut free, HEALTHY snacks that are tasty and purse-friendly. Until then, I’m considering following my brother’s suggestion, and making my own cereal bars. I wanted to talk about a few things. The fact that my first year of uni is almost over after only 6 months. The excitement of buying my first over-ear headphones and feeling like a DJ. The interesting things that have happened since I last blogged 15 days ago. Instead, I’m going to talk about something else. It is an upsetting revelation that many supermarkets still don’t care about (and don’t cater enough for) those people who don’t eat dairy AND nuts. Sure, they provide some dairy free products. They provide some nut free products. But if you want both, woah, that’s a whole other situation. 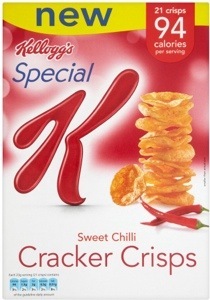 Or the other problem, when they try to sell one healthy cereal bar for the price of five ‘ordinary’ ones. There’s a small part of me that thinks it should surely be cheaper to make a dairy free alternative, because you’re putting one less ingredient into the product? But I’ve learned that this theory isn’t really considered a valid argument. It’s clearly too much to ask for a healthy, dairy and nut free cereal bar or snack (that isn’t ridiculously priced and/or only available in specialist stores), right? Well thankfully I come with good news today because I can safely say that I have found that snack. It was the Saturday before last at some early hour, when I came across it, beautifully hidden amidst the isle of gooey, fatty, chocolatey health risks. I was also going to mention that it is grossly unfair to label plain socks as men’s or women’s. Hear me out here. I went to Sainsbury’s (food shopping, obviously) and I had also wanted to get some socks, so I thought I’d just buy them there – to save time. I got to the little socks and tights section, and saw an array of beautifully patterned and designed, fluffy and silky socks, but that’s not what I’m after. I’m looking for the basic, simple trainer socks. The socks that you can throw on in a rush, or lounge about in them at home. The “I don’t really care” socks. I found a pack of three, fairly soft, plain socks in the women’s section for £3.50 – not bad, I thought. Just as I was about to put them into my trolley I noticed that a little further to the right side, in the men’s section, there was an almost identical pack of three, fairly plain, a tiny bit less soft socks, for £2. WHAT?! So just because I’m a female I should pay more for my socks? Is this some sort of sick joke? And as if to add a little salt in the burn, on the packaging the words “Men’s trainer socks” were clearly printed, while the women’s socks weren’t even labelled. Well needless to say, I bought the men’s socks. I considered the pros and cons, and I’m pretty sure my feet are okay with it. My resolve to blog weekly was overridden by unforeseen circumstances, and a large bit of laziness on my part. However I realise that I’ve left it far far FAR too long, and so I have decided that (starting today) I will post more consistently. I’m about to sound like a tourist in my own city, but I don’t really care. 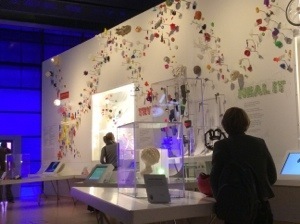 I had planned to go to The Science Museum with a friend one morning. The plan was to meet at South Kensington Station. I arrived about 45 minutes early, and so concluded that I should walk around the area to use up the time. I knew that the right exit lead to the Science Museum, so I decided to take the left exit. I mean, why not? I walked out feeling glum and bored from waiting before I’d even begun, but I tried to be positive. As I came out from under the covering of the station, I looked up. My breath caught. I honestly have never been so elated and shocked and stunned all in one. A vision of my dreams. Part of my future. 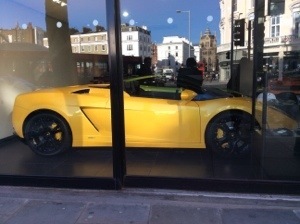 The Lamborghini London exhibit store. My gosh. I think I took about five photos, as many as I could get away with without looking creepy. I just couldn’t brush away the childlike glee and excitement. My gleaming smile was engraved in my face. The photos are so touristy and rushed that you can see me in the window’s reflection. This isn’t me being pretentious. When I saw the display of cars in front of me, it made my day. What can I say? I just have a thing for Italian cars, specifically the Lamborghini Murcielago. A friend of mine died just a few weeks ago. The funeral and thanksgiving service were on Tuesday. What do people normally say in a post like this? Yes I’ll miss her. Yes it is a shock, it is an outrage. She was only 16. So much potential, so much LIFE ahead of her. But I don’t want to dwell on that. I know that in all of this, God is still good. It is only by God’s Grace, and the Strength that Jesus has given to me that I am able to keep going. It’s been a tough week in many ways. Through stress and sickness, God is my Healer. God gives me peace. God has a plan. God is still good. So no, this is not me claiming to have no feelings, or to now be unaffected by what happened. But I recognise and cling to the Truth that in the midst of trials God is my strength. And life goes on. I heard someone say that as a writer be prepared to a) always take the tube because you won’t be able to afford a car, and b) get used to the idea that you will be miserable, and probably working several other jobs in order to pay rent. Can I just say that this is the a severely disturbing, and grossly untrue statement. It is also a cop-out, an excuse to not make the effort as far as I’m concerned. They basically said that there is no point trying to be a writer, as if it were a dying, hopeless profession. While it may be true that it is a highly competitive field, that does not mean it is a worthless pursuit. If you honestly believe that you won’t succeed, why are you even bothering? No one likes to waste their time, at least not to the extent of investing yourself in a fruitless cause. If you enjoy something creative such as writing, dancing, illustrating or whatever else your interests may be, and there is a potential for it to be fruitful, go ahead and pursue it. At the very least consider it a hobby. But I would challenge everyone that believes their chosen field is too difficult to get into to consider this: if you really believe that, why are you attempting to do it anyway? To some extent it’s about hope. You wouldn’t pursue something unless you thought there was at least a tiny chance of receiving it. So don’t be a downer on yourself as you pursue your creative passions. Don’t let your dream die, and don’t let fear hinder your progress.